 Seeing the increase in posts on various currency pairs, we have decided to start generic threads, this one being for less traded AUD & NZD pairs. All items related to these pairs should go in here, *unless* there is a specialized topic or question related to them. 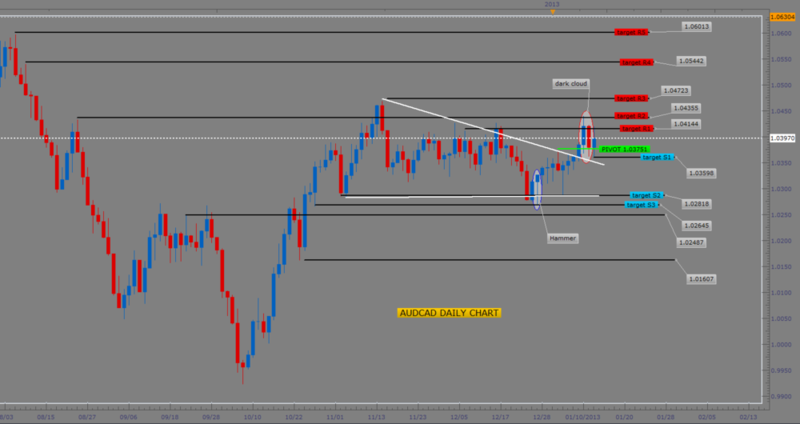 AUDCAD - is hammer a threat to head and shoulder break-out? 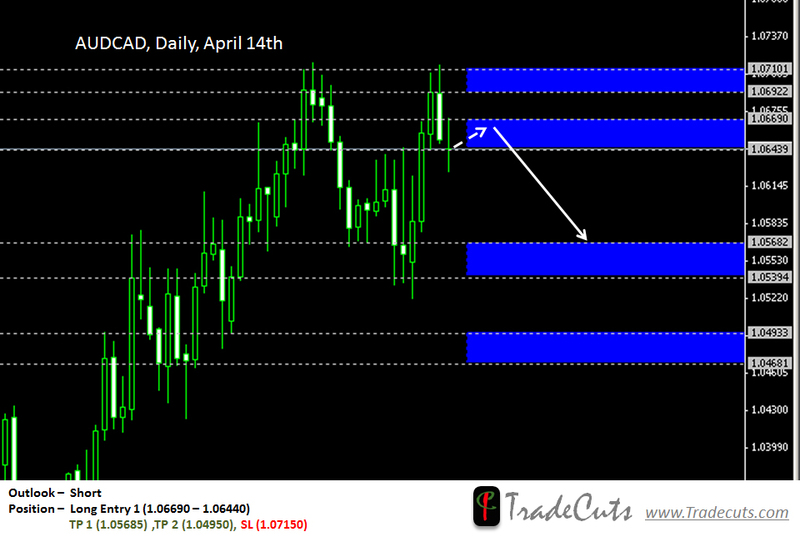 Audcad price completed a hammer today against S3/S4. Until bears can get through S5, the break-out from the head and shoulder mentioned in previous analysis remains vulnerable to a reversal and the hammer forming in this support area could spell danger for the bears. However, as long as price remains below pivot, the bears have the advantage and therefore for now, any bullish move below pivot will be treated as a mere retracement in a bearish market. Should price close above pivot, the bulls will be back in the drivers seat. See chart for pivot and relevant targets. I am in a sell in both my vollatility101 strategy and onepipatatime strategy. I have also put in a buy on my onepipatatime strategy at the close of today's hammer. After completing a hanging man on 12/28/2012 against R6, price has plummeted post fiscal cliff vote and is currently testing R2 in what is proving to be a huge retracement to previous bullish move. As long as price remains above pivot, the bias remains to the upside and therefore this move down can at this point, only be considered a pullback for another push up. 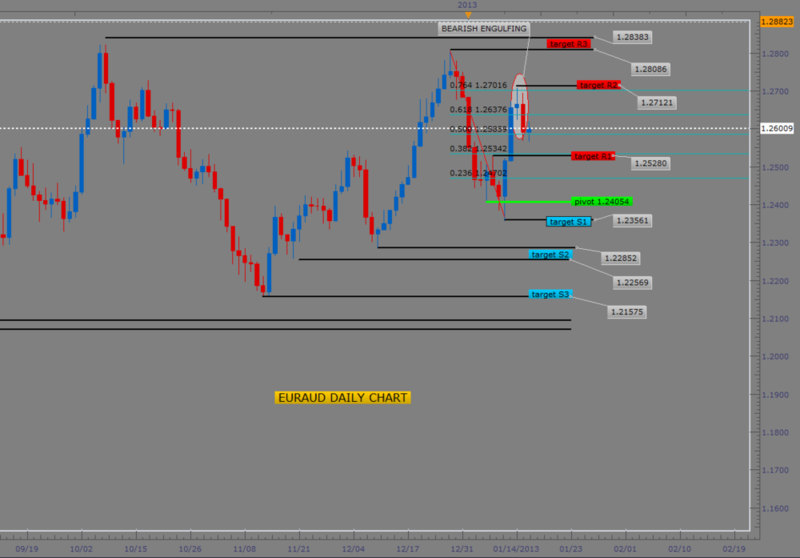 See chart with pivot and relevant targets below. I banked a good profit of 306.2 pips on a buy and am currently in a sell with a floating profit which I entered at the close of the hanging man. 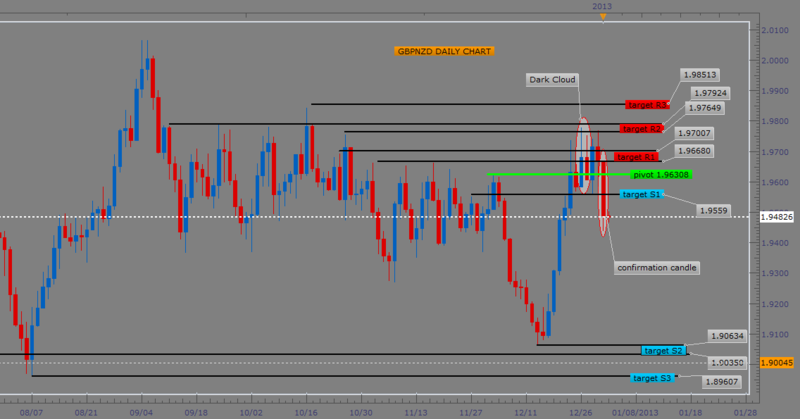 Price completed a dark cloud on 12/27/2012 against R2 and today this pattern was confirmed with a close below pivot. This means that bears have once again gained the advantage and should price remain below pivot, the S1 cluster is the first target. Potential huge move!!! See chart below for pivot and relevant targets. I entered a sell at the close of dark cloud and this trade has a floating profit at the moment. I have banked two buys, one profitable and one at a loss with overall profit between the two and have also entered a new sell at the close of confirmation candle today. AUDCAD - is shooting star going to dominate hammer? In my previous analysis I pointed a hammer out and asked the question whether this hammer was going to be a threat to the bearish bias. Since hammer formation, price has repeatedly tested S1 without success and finally completed a shooting star against S1 on 01/03/2013. So far this shooting star is holding its ground sending price down. Pivot has moved down to 1.03751 (the high of shooting star) and as long as pivot holds, the bias remains to the downside; however, it is also important to note that until price can drill all the way down through S5, the possible H&S target illustrated on chart is going to be a difficult one to attain. Should price manage to close above pivot, then bulls will have the advantage again. 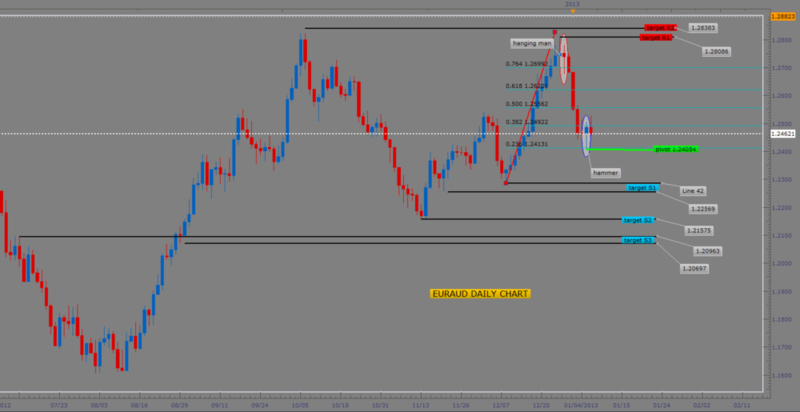 EURAUD - hammer on .236fib - does it mean anything? Price completed a hammer yesterday on .236fib; however, there is no support in sight besides the fib and if a fib isn't undergirded by a support or resistance it doesn't have as much punch to it. The reason why this hammer is mentionable however, is because price is still above pivot which means the bulls do still have the advantage in spite of sharp retracement to the downside as long as price remains above pivot. See chart below for pivot and relevant targets. Because bulls still have the advantage, I have entered a new buy on "onepipatatime" after banking profits on a previous buy. I am also in a profitable floating sell on this same strategy at the moment. I am currently in a sell on "vollatility101", trading the retracement and will hold that sell until I get further confirmation on a buy based on the hammer. WOOHOO - GBPNZD has reached its first target!!!!!!!!! After completing a confirmation candle to the dark cloud formed before that price has plummeted all the way down to first target (S2) and still going. Don't you just love it when a pattern comes together? See chart below for pivot and relevant targets. 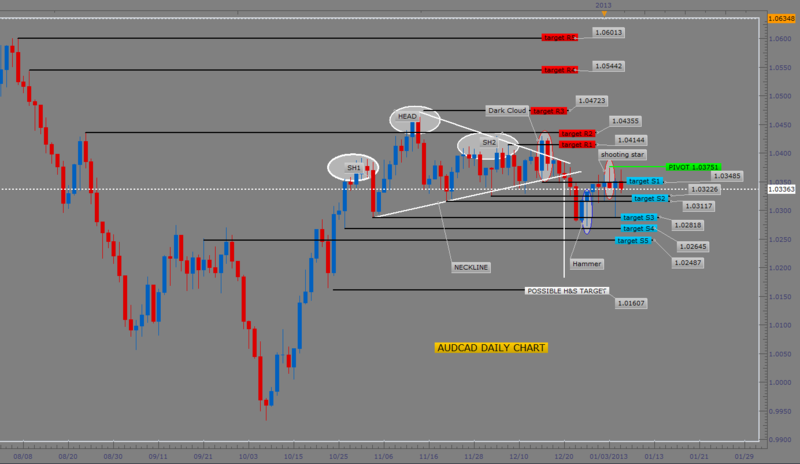 AUDCAD - shooting star negated - hammer rules! For a while now, I've been asking the question whether the hammer formed on 12/27/2012 was going to be a threat to the head and shoulder break-out and more specifically to the shooting star that formed on 01/03/2013. Well, the verdict is out - hammer rules!!!! 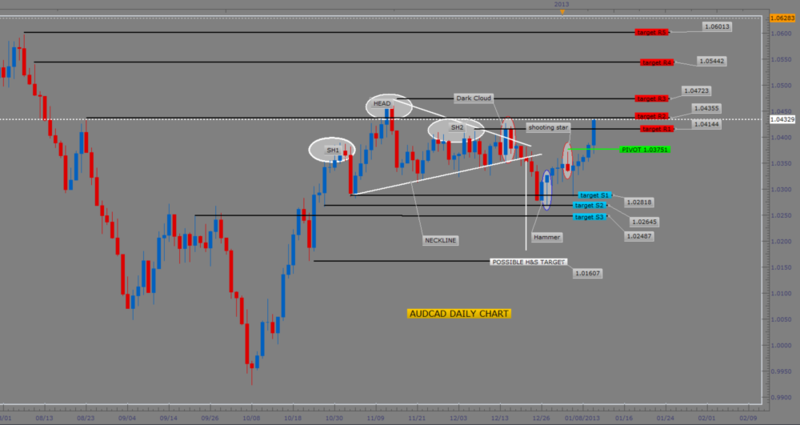 Price closed above high of shooting star and pivot yesterday leaving the bears in the dust. This is the wonderful thing about pattern trading. They terrific when they work and they're terrific when they fail because you have a predefined stop and when they fail, it's a powerful signal to get in the other way. See chart below for pivot and revised targets. I had a sell running on onepipatatime based on dark cloud and on vollatility101 based on shooting star and both were taken out for a loss. At the close of yesterday's candle, I entered a buy based on the failure of the shooting star on vollatility101 and I was already in a buy on onepipatatime since the completion of the hammer. See trades below. Price completed a bullish engulfing pattern yesterday, confirming the hammer which was formed on 01/07/2013 mentioned in previous analysis. Because this hammer formed on a weak support, it was challenged and the low was penetrated temporarily; however, it held its ground leading to the completion of bullish engulfing yesterday. See chart below for privot and relevant targets. I banked a profit on previous sell on vollatility101 and am currently in a floating profit based on a buy I entered at the close of bullish engulfing yesterday. See trades below. I also banked a profit on previous sell on onepipatatime. My buy that I entered based on hammer was kicked out for a loss when price penetrated the low. I re-entered buy at close of bullish engulfing and this trade is in floating profit right now. See trades below. AUDCAD - is dark cloud merely a retracement or a reversal signal? After completing a dark cloud formation, price has been bouncing off pivot to the upside ever since but staying below R1/R2 which gave rise to the dark cloud formation. Pivot is still at 1.03751 and as long as price remains above pivot, the bulls have the advantage and therefore for now, dark cloud can only be treated as a retracement in a market with a bullish bias. However, bulls need to gain momentum above R3 to get out of the grips of a triangular consollidation which has held the market hostage since November in some form or fashion. Should we get a close below pivot, then dark cloud will be confirmed as a reversal pattern which would bring S2 back into play but for now expect another push towards R1/R2 and even R3. GBPNZD - is hammer once again causing a reversal at the ever so familiar 1.9000 support area? After completing a hammer on S1/S2 support on 01/10/2013, price bounced sharply to the upside confirming hammer at the close of Friday. However, starting on Sunday evening, price retraced sharply downwards back into S1/S2 support and today once again, is bouncing off this support. With the sharp retracement, hammer has been weakened but not annihalated. Pivot has moved to 1.92944 and as long as price remains below pivot, the bears have the advantage and therefore the low of hammer is in danger of an attack. We need a close above pivot before hammer will be able to be a real threat. See chart below for pivot and relevant targets. My sell on gbpnzd was banked with a profit for vollatility101 and then I enterd a buy on vollatility101 at the close of confirmation candle on Friday but buy was taken out for a loss with sharp retracement of yesterday. At the close of yesterday's candle, I entered a sell for test of hammer low and beyond. See trades below. Once again we have a reversal signal (bearish engulfing) on a fib with no resistance to support it (previously we had the hammer on a fib - see hammer analysis). These are usually not strong signals and especially when they happen against the trend. Right now, as long as price remains above pivot, the trend is up and this pattern is pointing down so I don't have very high hopes for it but with fed annnouncement coming, it could cause a retracement down towards pivot before next bounce up. See chart below for pivot and relevant targets. 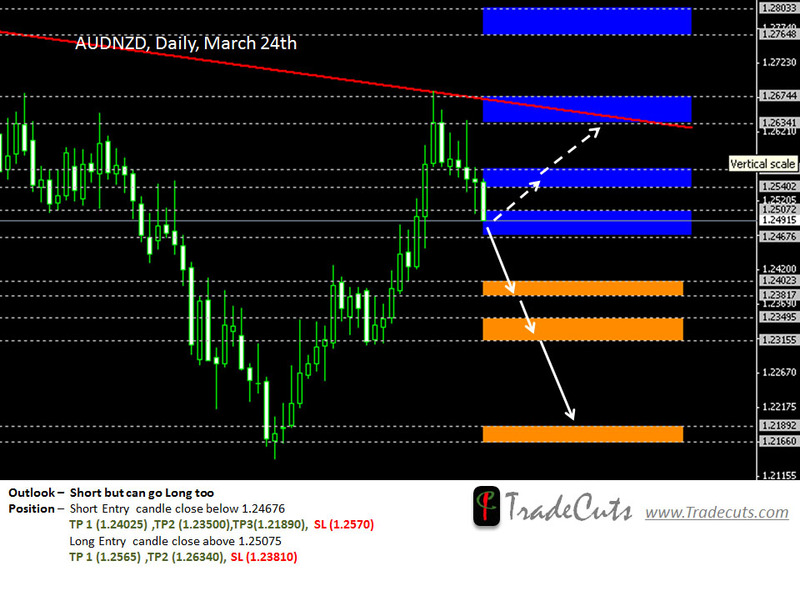 AUDNZD, has been trending down, currently bouncing off the trend line, with strong rejection at 1.26744 - 1.26341 zone. Current price action is testing some strong support thus there is possibility of short term long in overall short outlook. 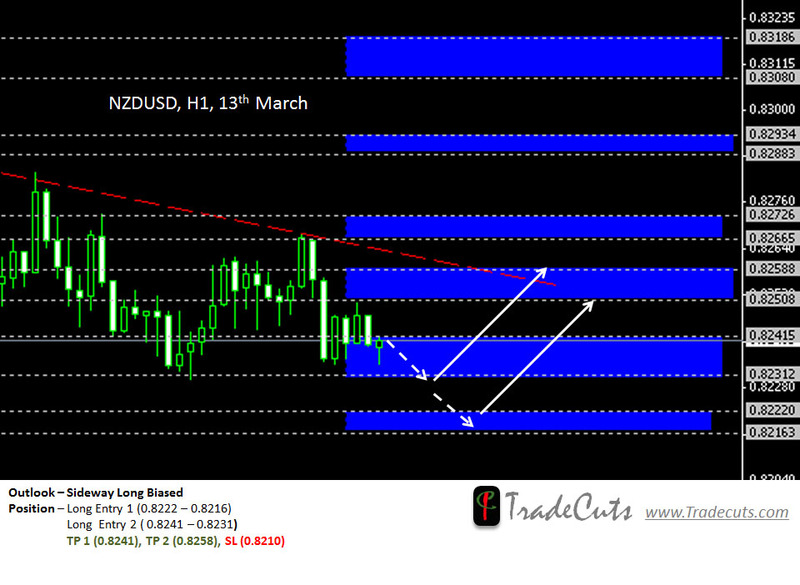 We expect AUDNZD short but in case of rebound expect it to retest the trend line and 1.26744 - 1.26341 zone. 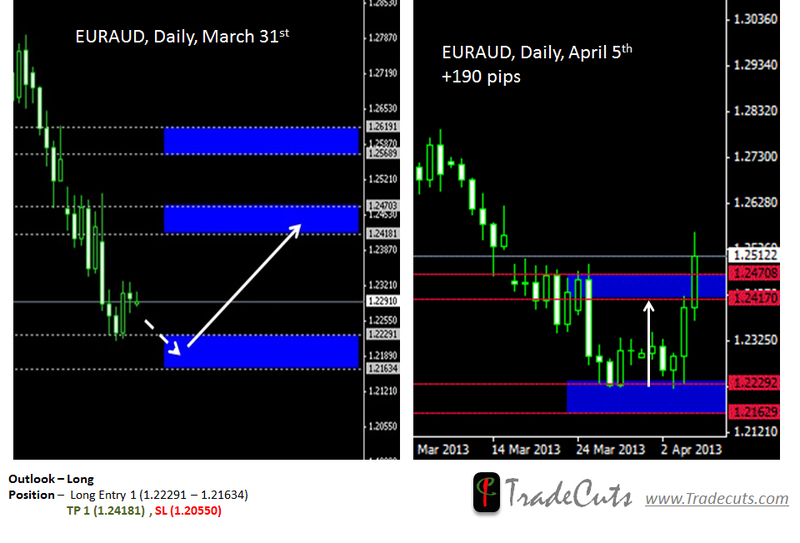 There is potential to make pips on both side thus wait for proper signal and take trade likewise. If you take this trade do let us know how it worked out for you. 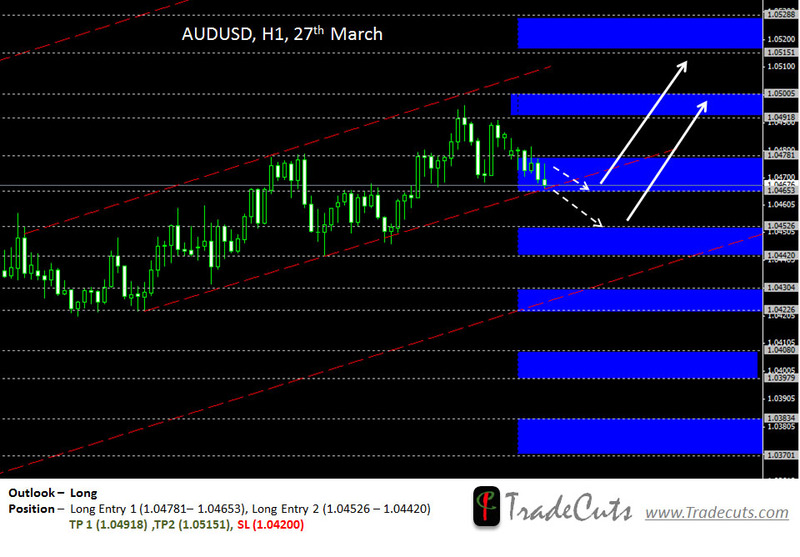 Today's pair is Aud/Usd. Overall strength of USD remains unclear and there is no clear direction. Current price action suggests sideways movements and mixed sentiments around USD pairs. 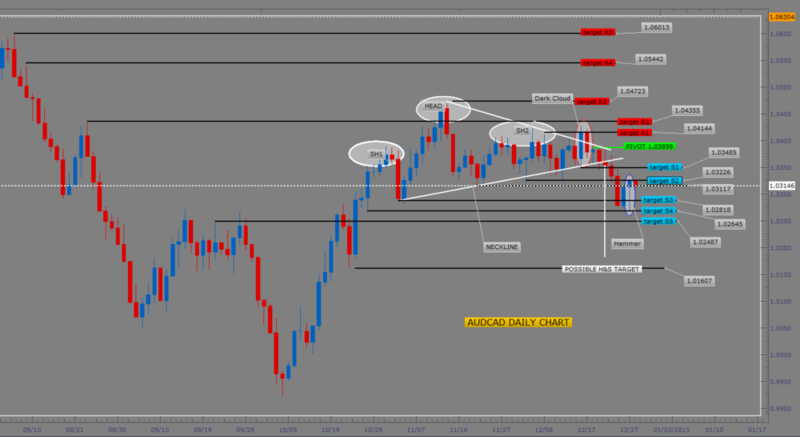 Trade USD pairs with caution and keep a hawk’s eye. 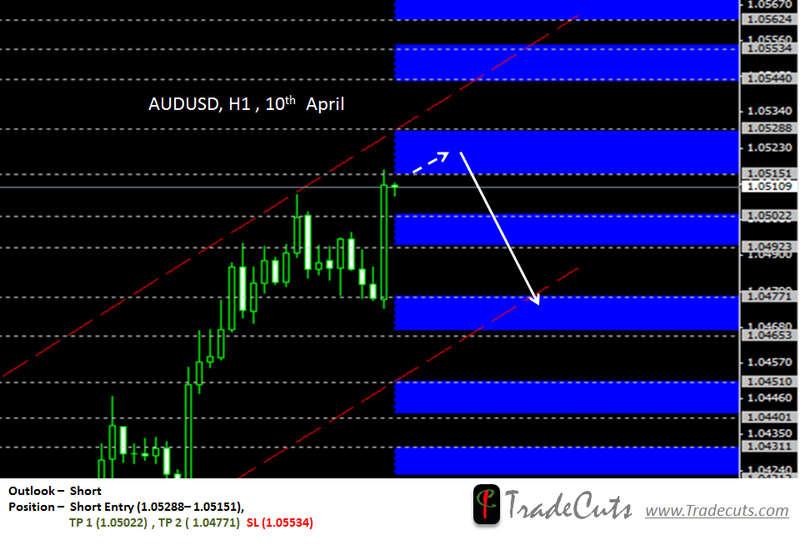 Earlier in the week (1st April) we had posted a high probability Tade Setup in Eur/Aud. It ended up giving us a profit of + 190 pips. Here is a look at the before and after chart. As expected USD weakened on Friday. Asian market started with corrective moves in most pairs. Considering Price action and resistance levels we are anticipating further weakening of USD in intraday trading. 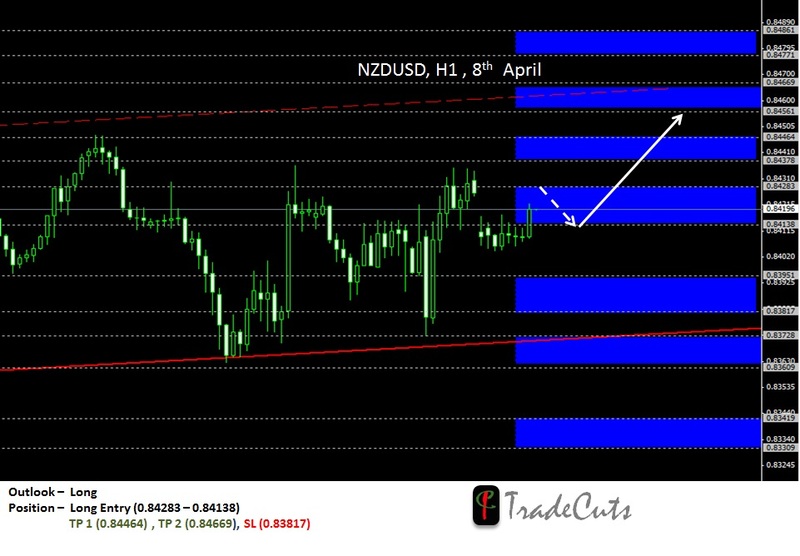 NZD/USD is also expected to retrace a little and then rise. Last week we got some nice pips from EURAUD Long (+ 190 pips). 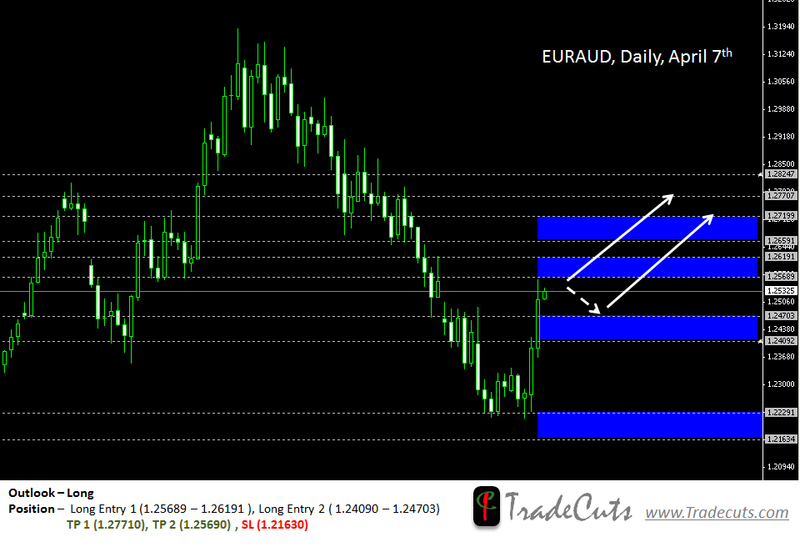 Looking at current price action and break out of strong resistance it seem EURAUD will stay Long. So lets ride along. Caution, small retrace is possible, thus we recommend to wait for proper buy entry. Since the last few days USD has weakened across the board. The current price action is testing some strong Resistance ahead. Considering strong resistance and weakening Bullish momentum corrective moves and reversal is expected for intraday traders. 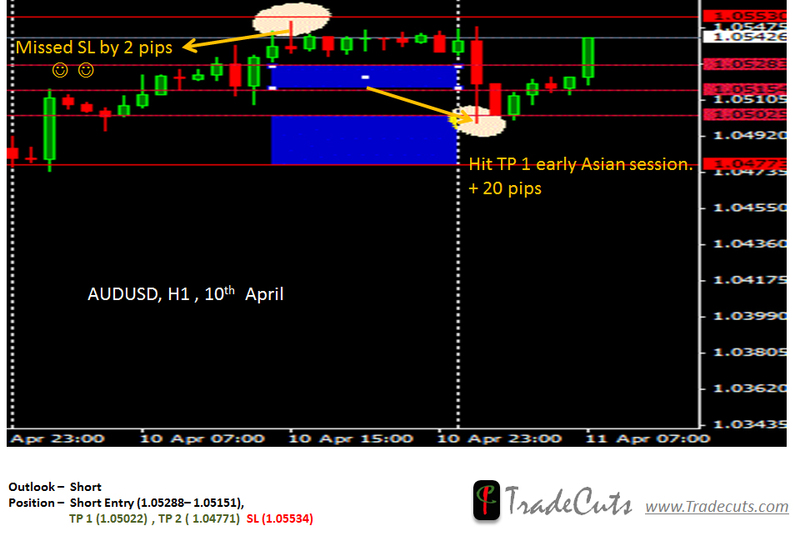 Our Aud/Usd Trade of yesterday missed the stop loss by a mere 2 pips and went to hit our TP 1 in the early Asian session today giving us + 20 pips. Here's an interesting look at the chart. 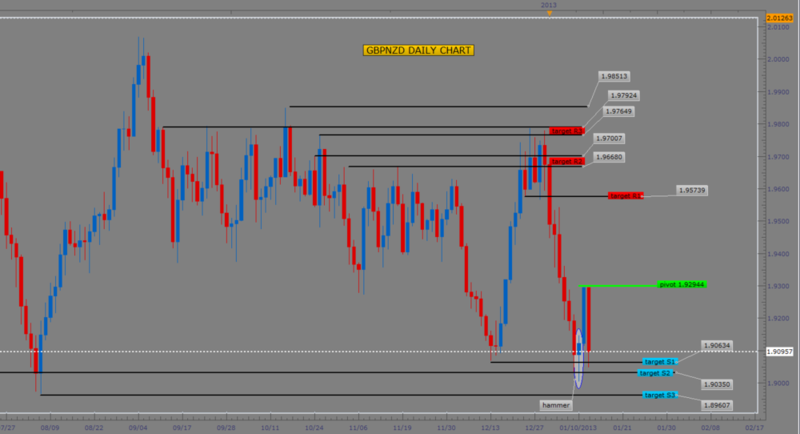 Double rejection at 1.07100 level provides us with "High Probability Short Setup." Candle formation suggests bears to gain momentum and test next support level at 1.05682. 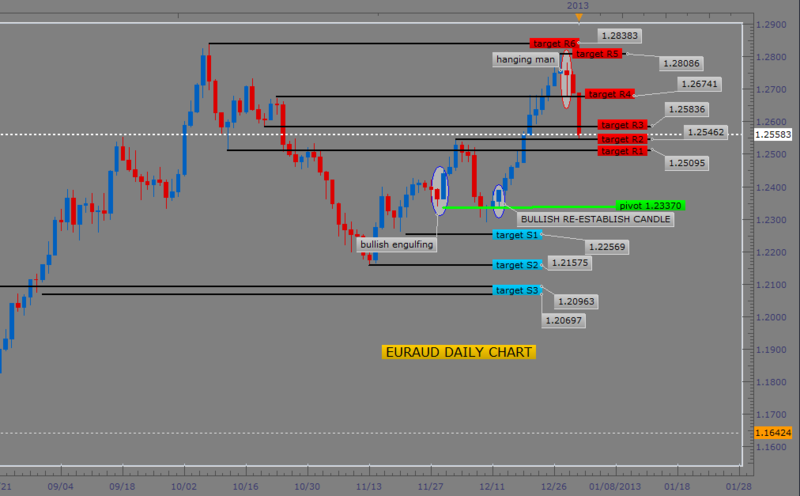 EUR/AUD---> already broke the daily resistance at 4560. After it breaks that you look for the next major level of resistance. 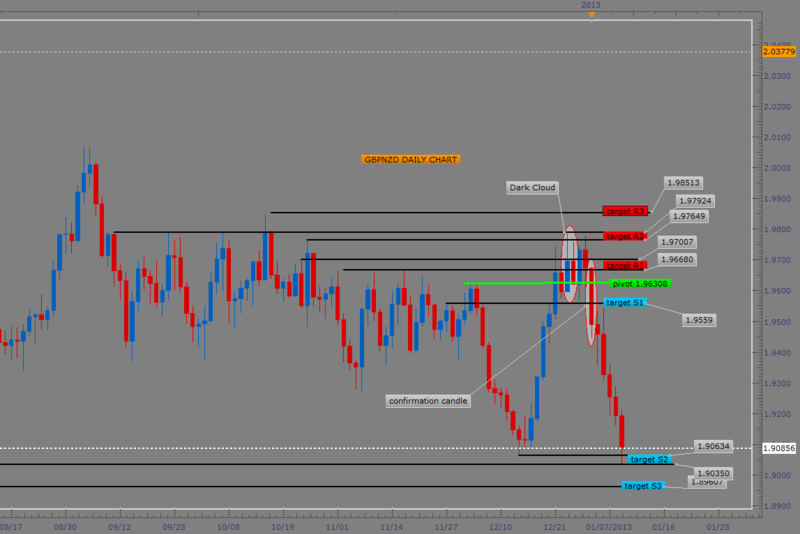 GBP/AUD--->This pair is showing up in both long and short strategies at the moment. 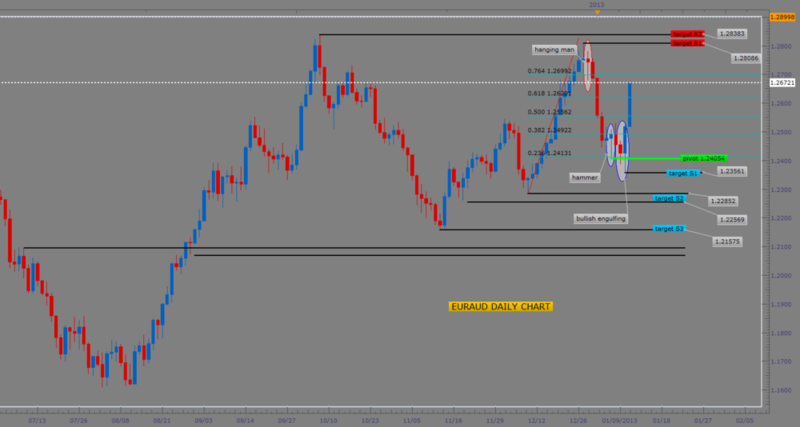 Going to probably dip a toe in on the short side at the start of trading today, the Chinese numbers should help AUD. But then again this move is largely due to RBA-guv speak cautiousness is warranted. End of year book closing coming up which usually helps USD. Which should spill over to other currencies. Will look back in a while.